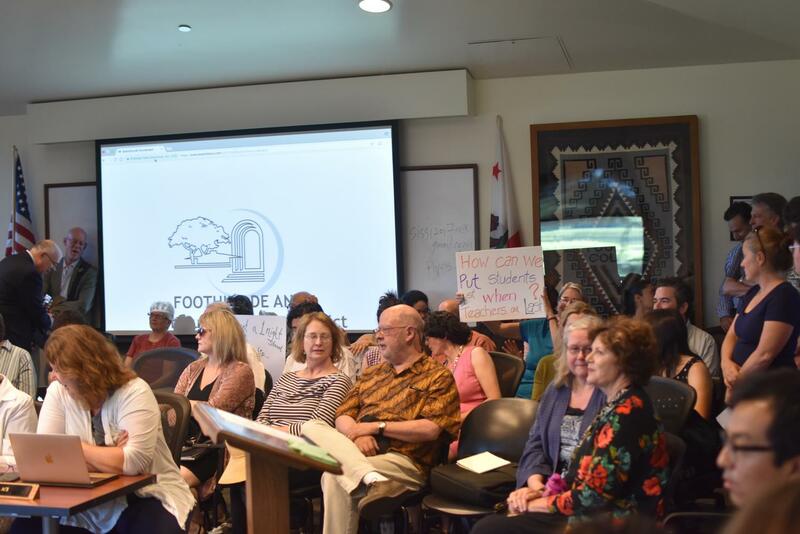 Faculty gather in protest of withheld cost-of-living adjustments at a Foothill-De Anza District meeting in June. 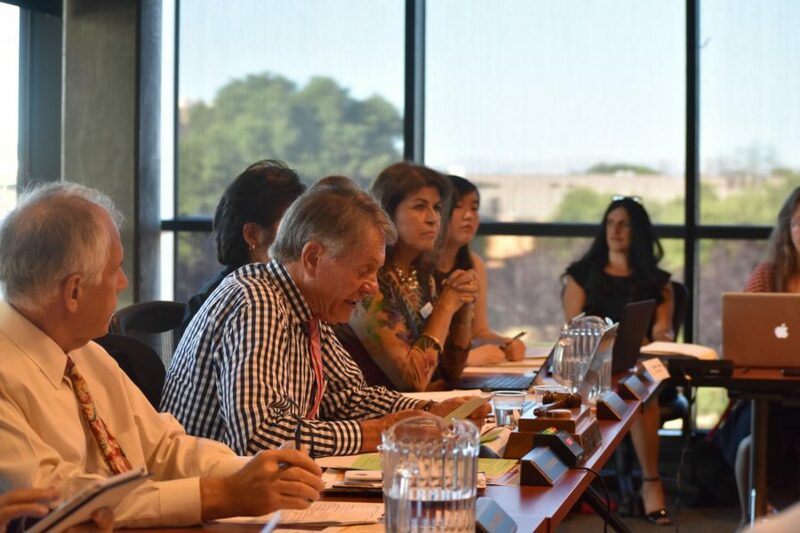 After months of tension surrounding the budget cut crisis, the Foothill College Advisory Council moved to begin the controversial process of eliminating jobs across the college. The council submitted the number of position eliminations to the Board of Directors on Nov. 2. The plan lessens the working hours of vulnerable part-time faculty, potentially rendering them ineligible for health insurance and other benefits. “Part-time faculty need to teach a certain number of credits to qualify for health insurance…so if those credits are cut, then they become ineligible for health benefits,” said Faculty Association Chief Negotiator Kathy Perino, who represents 500 full-time and 1,000 part-time instructors. The district-wide budget crisis heightened in the 2017-18 school year when the college suffered losses due to decreased enrollment, said President Nguyen. Students and faculty alike felt the impact of class cancellations, tense Cost of Living Adjustment boycotts, and proposed cuts to departments and student services. The cuts have also already heavily impacted part-time faculty, said Association of Classified Employees President Chris White. “We balance the budget on the back…of adjunct instructors. That’s not just at Foothill, that’s how it’s done across the country,” said White. White predicts that most of the layoffs from classified employees will impact exclusively full-time positions. However, all of the current positions slated to be cut from the Faculty Union are listed as “vacant.” Unassigned hours for empty positions are instead worked by part-time staff. There are 21.0 full-time vacant faculty positions planned for elimination. It takes multiple part-time positions to add up to the equivalent of a full one, and thus the decision will impact more than 21 individuals. Foothill-De Anza District administrators respond to faculty concerns at a June meeting. The Association of Classified Employees union has requested that the names of the cut positions not be released. The intent is to keep panic from spreading, as the layoffs will affect entire departments. Workers whose positions are not eliminated may still be “bumped” by their superiors. Tenured professors and other faculty members in higher-up positions may be contractually entitled to be rehired in a subordinate’s job. These switches would push the original, lower-ranking worker to the curb. An analysis to determine which employees will be eligible for bumping is being conducted by Human Resources through November and December. The number of positions that need to be eliminated can be supplemented by positions where the employee has retired. Employees have been incentivized to retire with the announcement of a Supplementary Employee Retirement Package. If an employee announced their intention to retire by Nov. 2, they would be eligible for additional benefits. The Board of Directors will make its decision on whether or not to approve SERP on Dec. 10. Withholding names, however, could also hamper organizers’ ability to critique the proposed cuts. “There’s no way to give the administration any sort of feedback about whether this is a good idea or a bad idea because we don’t know where the cuts are coming from,” said Perino. A town hall with a 30-minute comment period was held on Oct. 24 to provide a forum for the Foothill community to bring forth their concerns. Feedback was also gathered online through the president’s website and provided by Nguyen to the council. The names and titles of positions to be eliminated are slated to be released in January or February of 2019.